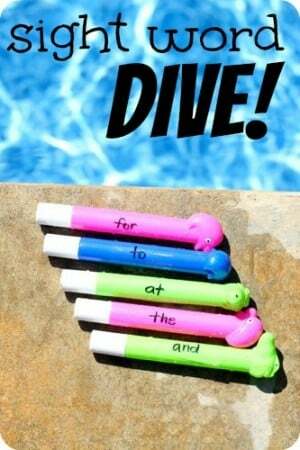 Sight Word Dive - I Can Teach My Child! One of our favorite things about the summer is swimming. My parents have a pool and we live about 2 miles from a YMCA waterpark, so we are in the water a lot! Unfortunately, Little Brother has had some major respiratory issues lately (pneumonia about six weeks ago and walking pneumonia 2 weeks ago) so we haven’t been able to swim yet this summer due to the potential for chlorine to worsen his breathing issues. After waiting a few weeks, we were finally able to go swimming! I came up with an idea to help reinforce the sight words Big Brother has been working on by doing one of his favorite activities: diving for dive rings sticks! Here’s what you’ll need: Diving sticks (ours were $1.50 at Dollar General), packing tape, and a permanent marker. 1. Wrap each diving stick with a piece of packing tape. Write your preferred sight words on each stick (I wrote them on both “sides”). 2. Grab an eager swimmer to dive for the sticks. 3. 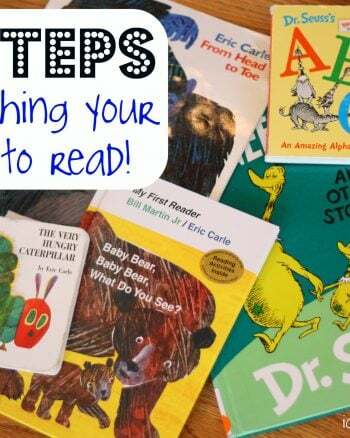 Have your child read the word once he/she draws it from the water! *Although it should go without saying, please make sure your child is supervised AT ALL TIMES while in a swimming pool or near any body of water. 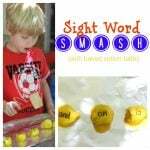 Check out more sight word activities here. 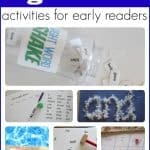 This is such a clever idea for reinforcing learning this summer! I LOVE it and am excited to try it with my 5 year old!